There seems to be bike events taking place all over the country these days with the ever-growing popularity of cycling. There’s also the growing trend of cycling festivals. They’re not quite T in the Park but it’s great to see these events bring so many people from across the country together to ride, have fun and get out in the mountains. A new and exciting cycling festival, not too far from the muddy fields of Balado, has sprung up around Perth on the East of Scotland. The kickoff event for the Highland Perthshire Cycling Festival, before a week of packed activities, was the Highland Perthshire Enduro. 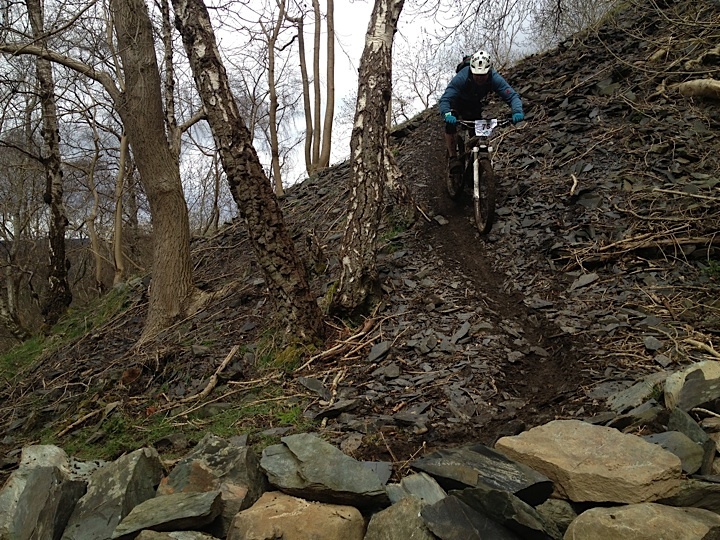 Experienced event organisers No Fuss Events brought their skills from running the likes of the Tour de Ben Nevis and The Dudes of Hazzard ‘This is Enduro Now’ Enduro events to the East coast. It was great to see the cheeky monkey and the team around creating the usual relaxed and enjoyable racing atmosphere. The event was a stage enduro race. A course of around 50km faced the riders at a leisurely 9.30 am with 4 timed stages over the distance which count towards the overall placing. Some enduros give points for your placing at each stage. This time it was an addition of your stage times. With over a 150 riders this was a well-attended event with some good riders turning up. What I like about enduros is the range of people it can cater for. Most that have been on a mountain bike before should be able to race. There are chicken runs for those still improving and likes, if you spot them, which are for your high skilled rider. The distance is knackering but a challenge in itself. Thankfully this wasn’t timed! Enduro races are normally spread across two days of competing. 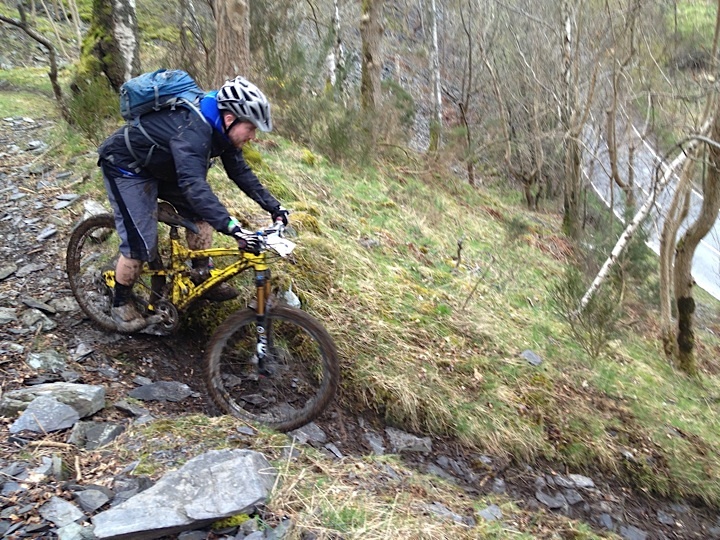 The lack of a practice day for this event made riding the stages blind pretty hairy at times. A few trips into brash and bushes were expected I think! I certainly made some detours! Around 10km from the start and a long climb the first stage awaited all. It was a lung buster. Riders on XC bikes made some big gaps on those riding short travel bikes. 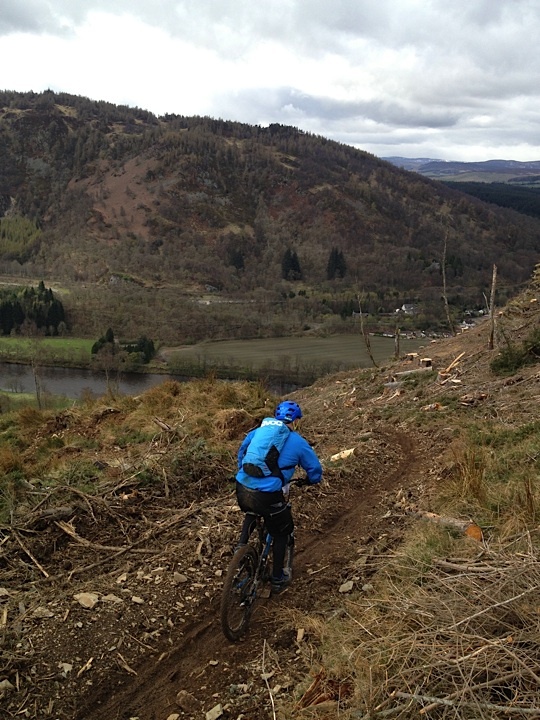 A sloppy single track contoured around the hill, with scenic views to the famous Schiehallion. Before kicking up for a long burning climb. On arrival through the dibber zone, after 4.5 km and a short downhill later there was a scene of spread bodies, coughing and people gasping for air. Almost a minute ahead of anyone else on this stage was Robert Friel. If anyone can tell me what he ate to fuel him on that stage please get in touch. Great ride! Stage two was fresh, fresh and insane. I met one guy at the start of stage 3, which was 30 km into the ride, still shaking from adrenaline of just getting down it. It was loose, fast, muddy and steep. It had to be the highlight of the event for me, not my best stage but a lot of fun. James Shirley won this stage, an impressive win given the difficulty of the track and riding it blind. Heading south towards stage 3 you enter Dunkeld and cross under the A9 before a long and steep climb to the start. Another long 2.5km trail, flat to downhill this time and no long climb. It entered some tricky woods that claimed a few injuries, not quite as many as stage 2 though. I managed to win this stage, just a few seconds in front of Ben Whitehead and Alistair Parkin. Riding a track like this blind got the pulse maxing out. Now over half way round I think most were starting to feel the burn. For most the thought of the finish was in sight, but for those used to racing the Scottish downhill scene, there was the excitement of hitting up the final stage. 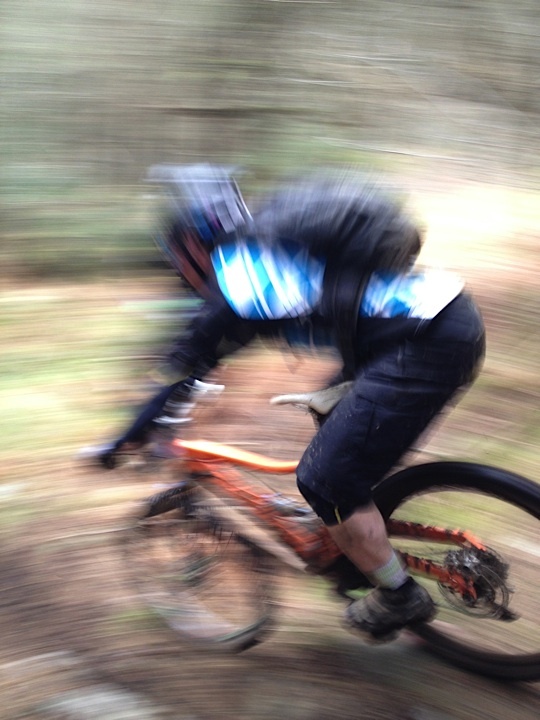 The last timed stage took riders down the bottom half of the infamous Dunkeld downhill track. Plenty were struggling with this with the mass of rocks there to catch you out. Things hurt, a lot when you take a tumble here. Probably like being in the ring with Rocky when he takes Apollo Creed out. This was a track to know, the route was changed a lot with some really difficult sections. James Shirley made it two stage wins by taking the final stage by a few seconds in front of Gravity Enduro Innerleithen Round 2 winner, Mark Scott, and myself respectively. Both Stuart Wilcox and Ben Miller, two Juniors, finished in 4th and 5th having some consistent rides on all the stages. These boys schooled most of the field and their catergory. Rounding the podium in 3rd was Jamie Carchie. In the Seniors, it was a full Orange Mountain Bikes affair with Huw Oliver stepping onto the top box as well as taking the fastset time of the day with 18 minutes and 34 seconds. James Shirley took 2nd with myself in 3rd. The Hardtail option this weekend seemed optimal over the Fives. Rob Friel put a significant amount of time into Stuart Villis in the Masters Category. 3rd going to Duncan Jamieson. 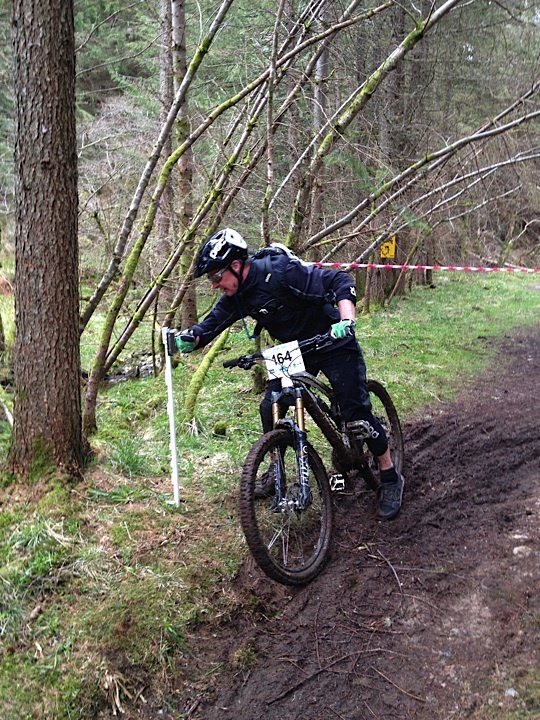 In Vets the super fast Iain Nimmo put in almost 3 into Mike Hadgson and Barry Coull. An increasing attendance in the womens’ downhill events was noticeable and great to see. Sophie Buckingham took a well deserved win narrowly pushing Roslynn Newman into 2nd. Summit Downs Catherine Smith closed out the top 3. Thanks to Ross Young for the Imagery.